Allegations that US President Donald Trump could have worked for Moscow’s interests were dismissed as “absurd” and “stupid” by Russian officials. Russian Foreign Minister Sergey Lavrov told a news conference that US media reports claiming that Mr Trump might have been a Russian agent reflected a dramatic plunge in standards of journalism. Mr Trump said this week he had never worked for Russia and repeated his claim the investigation into his ties to Moscow was a hoax. Asked whether Russia could release the minutes of Mr Trump’s one-on-one negotiations with president Vladimir Putin, Mr Lavrov dismissed the idea, saying it defied the basic culture of diplomacy. He added that such requests reflected illegitimate meddling in the US president’s constitutional right to conduct foreign policy. Mr Putin’s foreign affairs adviser, Yuri Ushakov, similarly derided the claims that Mr Trump might have worked for Russian interests. “What kind of nonsense are you asking about?” Mr Ushakov snapped when asked if Mr Trump was a Russian agent. “How can one comment on such a stupid thing? It has reached such a scale that it’s awkward to even talk about it. The Kremlin’s hopes for better relations with the US under Mr Trump have been shattered by ongoing investigations into the allegations of collusion between Mr Trump’s campaign and Russia. Mr Ushakov noted that Russia-US relations were currently at a level that “can’t be worse”. Mr Lavrov said a probe led by special counsel Robert Mueller had produced no evidence of Mr Trump’s collusion. He particularly scoffed at the charges levelled against Mr Trump’s former national security adviser, Michael Flynn, saying that he talked to the Russian ambassador only in a bid to protect US interests. “It’s quite obvious that the situation is absurd,” Mr Lavrov said about the US probe. He also criticised Washington for its intention to opt out of a key nuclear pact over alleged Russian violations. Mr Lavrov noted that earlier this week, the US had ignored Moscow’s proposal to inspect a Russian missile that Washington claimed had violated a nuclear arms treaty. He said that Russia made the offer during talks in Geneva, but the US negotiators stonewalled the proposal, repeating Washington’s demand that Russia destroys the 9M729 missile it claimed violated the 1987 Intermediate-Range Nuclear Forces Treaty. US Undersecretary of State Andrea Thompson said following the talks that “the meeting was disappointing, as it is clear Russia continues to be in material breach of the treaty”. Turning to last month’s arrest in Moscow of Paul Whelan, a former US Marine, on suspicion of espionage, Mr Lavrov said the man’s brother had visited Moscow and had been briefed about prison conditions. The Interfax news agency later carried the foreign ministry’s statement saying that Mr Whelan’s brother was not in the Russian capital. Mr Lavrov rejected claims Russian authorities could have arrested Mr Whelan in order to swap him for one of the Russians held in the US, saying “we don’t do such things”. He said Mr Whelan was caught red-handed and the investigation was ongoing. Mr Whelan holds citizenship from Ireland, the US, Britain, and Canada, and Mr Lavrov said Russia would allow consular visits. Mr Lavrov insisted that Moscow was not taking any sides over Britain’s exit from the EU. He rejected allegations that Russia was gloating in the turmoil, saying that Russia was interested in a “united, strong and, most importantly, independent” EU. 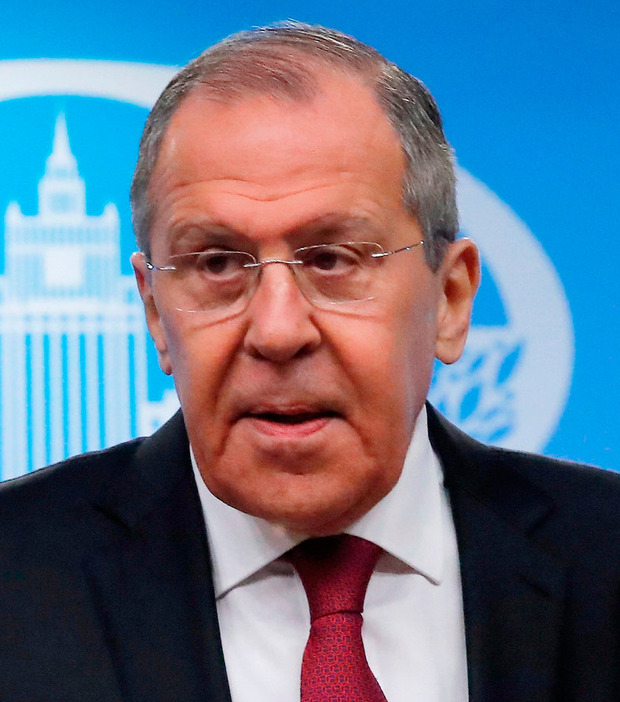 Commenting on the situation in Syria, Mr Lavrov said that Moscow expected the Syrian government to take over territory in the country’s east following the planned US military withdrawal.